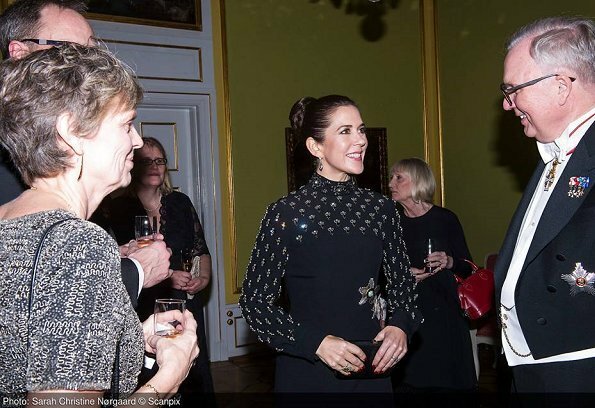 In the evening of December 6, 2017, Crown Princess Mary of Denmark attended a Gala party at Copenhagen Moltke's Mansion, held in connection with celebrations of 100th anniversary of Finland's independence. 100th anniversary of independence of Finland was celebrated all the year round with the themes called "Yhdessä", "Sammen". Very hard to make any decision based on ONE photograph! Mary looks beautiful! Wow, that hairstyle makes her glow. C'est exactement ce à quoi j'ai pensé en regardant la photo. Peu importe, elle est très jolie. LOL she's channeling carrie fisher there..perhaps its a theme going on.. I miss to see other members of the royal family on duties out there: especially Marie! Too much Mary …… but of course she needs to be on duty to show her latest fashion buy! Crown Princess Mary is married to the future King of Denmark. She is a hard working woman and therefore her work is covered in the media, that´s just natural!! She is married to number 6 in line to the Throne, he doesn´t work much either and not much in the media. A lot of danish people think, that the couple is lazy and would like to see them stepping up their game!! Especially now where the Queen is getting older and her husband is sick. And your remark about Cp Mary´s fashion is a low punch, look at the work she is doing, she is one of the most respected and wanted Royals in the world, NOT because of her style/fashion, but for the reason that she is very intelligent!! In your wish perhaps!Mary is not a working hard royal at all.One of the world most expensive CP I would say.So much expensive outsfit,and then at the same time feeling sorry for the poor ones....oh dear,intelligent or a media girl?I think the taxepayer have another opinion than you. Martin - relax. No-one said that Mary is a bad person, she IS indeed hard-working, and yes, she´s respected and the media covers her accordingly. But, there´s no way of denying that Mary loves that attention, and that she enjoys to be seen and admired. She has the most photocalls of all the princesses around, she likes to get her pictures taken, and she has repeatedly released obviously photoshopped images that clearly indicate that she cares very much about how she´s perceived and that she wants to portray the perfect princess image. While I never liked her much (because of these exact reasons and her coming across (to me) as somewhat shallow), I do give her credit for both working hard and for having a good fashion taste (most of the time). Cp. Mary gets £ 235.000 a year!! The danish Royal Household is one of the least expensive in the world.... Including the members of the Royal family of course!! Cp Mary IS a very hard working woman - you can check it out, she is going to work every day almost. Some days she has several obligations and so on! !If not in Denmark she is travelling the world, not on holidays, but work related. Ps. We see her in gowns constantly that have been worn before, altered and so on. - Where do you get that information from?? It not true!!! I know her stylist, her make up stylist and so on, I know what´s going on, and you are totally wrong!! I too can read between the lines and i totally respect the fact that we have different opinions, but get the facts right and the we can talk!! Martin Iversen:The hardworking Mary also has the largest number of service people employed for a crown princess!!! And the amount you mention is for her own disposition/consumption. Together with Frederik she gets more than € 2. 685,000 tax-free (Google). And they have a lot of privileges such as free homes. I have worked in the diplomacy for many years and know, that invitations are sent to the court (administration). Only a few are 'earmarked' to certain persons with the exception of their patronage! Seems like YOU are a big fan of Mary and dislike Marie, why else write and included …… 'a lot of Danish people (!) think she is lazy', it is also your own opinion, right? But isn't the fact, that Marie only gets the jobs 'the hardworking' (!) Mary not is interested in !!! From outside it seems so. Marie has not her own chief in The Royal House and she can't choose jobs by herself! You make me smile lol. We are talking about Cp Mary - what her husband receives is NOT the topic here!! About the amount of people who works for Cp Mary well it´s natural that she has them employed, she is the head of the organisations and cant´t do the job all by herself hehe..
And about the workload Princess Marie gets going, it´s not just my opinion it is a fact that she, together with her husband, are the members of the Royal family who works less than the others!! I used to work for the Royal household for quite some years. And I can tell you another fact. The members of the Royal family chooses what areas and organisations the would like to work fore!! By that you're twisting what´s going on because it´s NOT true!! Oh no Martin,that is not true that you have worked for the royal family at all.The contract you have to signe for all work is nothing you can talk about,not even mention in a blogg like this,topsecret.In your wish again. And very sweet of yiu to let 5s know that you are a big fan of Denmark most expensive CP throughball times. A fashion queen who loves the attention,and married to a future king that runs away from the media .....what a couple to pay for! Martin Iversen: I'm wondering, why you almost seem to hate Marie to highlight Mary???? I have now read and checked facts (!) about Marie and know, that she works part-time for the Danish Emergency Management Agency and is affiliated with the South Danish University and helps to develop concepts for new foreign students ( she speaks four languages, ​​besides Danish, French also English and Spanish). And that's normal in Denmark, that prince and princesses do different work besides royal duties (princes most within the military). When you are make comments, why do you use facts about Mary and gossip about Marie?! There is also a lot of gossip going on about Mary. Why not comment on your own views, instead of use: a lot of Danish people think? And can you seriously mean, that the €2.685.000-apanage is only to Frederik and not to Mary…… lol. Too harsh make-up and up-doe to very feminine Mary. Not the best outfit either. Its not the best of Mary's looks but not totally bad either. But I must say that I absolutely hate her hair styled like this. Too tight and severe. Reminds me of the Swedish Crown Princess's hairstyles! Mary is the hardest working princess and is a good representative of the Danish Royal family. I love her hair and outfit. Love seeing what Mary wears and love how she mixes up her hairstyle to suit. Don't love this look but think it's interesting enough. And can never see too much Mary on this blog! Mary herself looks lovely, radiant, happy and engaged as usual, however, the gown doesn't do much for me. I love the dress but I'm a not a fan of the rather harsh hairstyle. It ages her a bit and she has had better up-dos. Yes Martin Iversen, I totally agree with you, Mary is a very hard working member of the Danish royal family, and I am sure her duties had even doubled, now that prince Henrik is sick. I just want to know WHAT does prince Frederick do all the time, I mean half of her duties she carry out alone! What I love about Mary is that she is a natural. She's been trained in all aspects of protocol. And through guidance and format, I think she is doing very well.She has a perception all her own, and id happy in her own skin, She can not make everyone happy but for me, its nice to see change.